NOTE: Here ‘free space’ refers to the ‘classical vacuum’ as found naturally in outer space. The conclusion that speed of light is constant was first postulated and later verified experimentally with a certain precision. The speed of light is directly related to permittivity and permeability of free space. Permittivity of space is a constant that relates to the amount of resistance encountered when forming an electric field in a classical vacuum. Permeability of space is a constant that relates to the amount of resistance encountered when forming a magnetic field in a classical vacuum. Maxwell’s equations use the constants of permittivity and permeability in describing how electric and magnetic fields are generated and altered by each other in free space. The speed of light is the inverse of the square root of the product of permittivity and permeability. 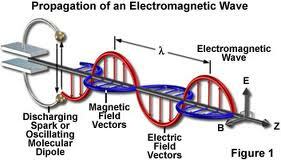 Light is an electromagnetic wave that is made up of alternating electric and magnetic fields. These electric and magnetic fields appear to be disturbance in free space. Thus, light appears to be a disturbance that propagates through free space, the same way that sound is a disturbance that propagates through air. In a disturbance, only the undulations of media propagate outward from the point of disturbance. There is no mass propagating forward. The speed of light depends entirely on the permittivity and permeability of free space (vacuum). This is analogous to how the speed of sound depends entirely on the characteristics of air, such as temperature, pressure, etc. Theory of relativity proceeds from the postulate that the speed of light is constant for all frames of references. The speed of light, therefore, acts as an absolute for the theory of relativity. Since the characteristics of free space determine the speed of light, free space acts as the absolute frame of reference for the theory of relativity. Free space seems to be defined fully only when space and time are considered together as ‘space and changes in it’. Regarded separately, space and time appear to be relative as shown by the theory of relativity. Free space as SPACETIME seems to represent the absoluteness underlying the physical universe. Can we determine the Matter wave of earth and compare it to light wave? If we can, then that would validate spacetime as an absolute frame of reference from the perspective of relativity, while ether could not be so validated. 1. Spacetime would then act as an absolute background. 2. Disturbance of spacetime would then give rise to electromagnetic phenomena of light, and spacetime would determine the propagation velocity of the electromagnetic phenomena. 3. Spacetime would act as the over-all rest frame for the universe. All other velocities as waves may then be determined relative to this rest frame. 4. Any physical consequences of those velocities can then be considered as having an absolute, i. e. real effects. Spacetime seems to be both static and dynamic in an absolute sense. 1. Ether was postulated but then put to rest by Theory of relativity, which postulated spacetime. 2. The basic characteristic of spacetime would logically be a wave, which is dynamic compared to ether which was assumed to simply fill the space. 3. The motion of Earth could not be measured relative to ether. Can the motion of earth be measured relative to spacetime? 4. The comparison can be with respect to wave-length, speed, and acceleration. 5. The acceleration of light is zero, speed of light is constant. Its wave-length varies from very long to very short. A system seems to approach absoluteness as it gains consistency or symmetry, and has properties that are constant or conserved. Linear momentum is also a conserved quantity, meaning that if a closed system is not affected by external forces, its total linear momentum cannot change. In classical mechanics, conservation of linear momentum is implied by Newton’s laws; but it also holds in special relativity (with a modified formula) and, with appropriate definitions, a (generalized) linear momentum conservation law holds in electrodynamics, quantum mechanics, quantum field theory, and general relativity. These notions imply that absolute space and time do not depend upon physical events, but are a backdrop or stage setting within which physical phenomena occur. This week you’ve written some of the freshest ideas yet since I’ve been reading you. I’m intrigued by your newest take on mass, momentum, and their relationship to space time. 2. EMR = a disturbance in spacetime. 3. Could an elementary particle be a wave packet of disturbance in space? All the ideas that I am presenting here have been there all along. I am trying to knit them together. Yes, that is my ongoing hypothesis — that the ideas are always there, always present, appearing and disappearing just as you and I do my dear friend. Chris: What are you driving at? Are you looking for my clock?